Sir Paul McCartney and his wife Heather have visited freezing ice floes in Canada to call for an end to the annual cull of young seals. The former Beatle, who posed with seal pups, said: "In about three weeks time the baby seals are due to be clubbed to death or shot. "For many years people have been trying to have this brutal practice stopped." A Canadian government spokesman said the cull was necessary and the couple had been given inaccurate information. Each year 300,000 seals are killed, earning 16.5 million Canadian dollars (£8.3m) in commercial meat and pelts for thousands of local hunters. "They say 'we've been doing it for 500 years', but that doesn't make it justifiable," Sir Paul said on an ice floe that stretched from the Magdalen Islands to the eastern Gulf of St Lawrence. Fisheries official Phil Jenkins said the McCartneys' visit would have "no impact on the government's policy or the hunt" and called their information "filtered and incomplete". 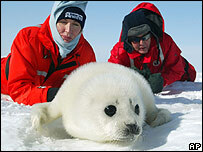 Canada banned the killing of seals younger than 12 days old in 1987 amid criticisms and threats of European boycotts. Breeding adults are also off limits to hunters, Mr Jenkins said. Since then the protests largely disappeared. But Canada awoke the wrath of activists in 2003 by approving a cull of 975,000 seals after estimating their population had grown to 5.9 million, nearly triple the number in the 1970s. The Dalai Lama, singer Charles Aznavour and actors Kim Basinger and Juliette Binoche are among those to have campaigned against the hunt. Sir Paul McCartney and his wife Heather were invited to publicise the campaign by the US Humane Society. He suggested that eco-tourism could replace the hunt to boost the depressed local economy, describing the thousands of seals as "a magnificent wildlife spectacle". But Jean Claude Lapierre, president of the Magdalen Islands sealers' association, said numerous tourists on the ice would be distressing for the pups and their mothers.